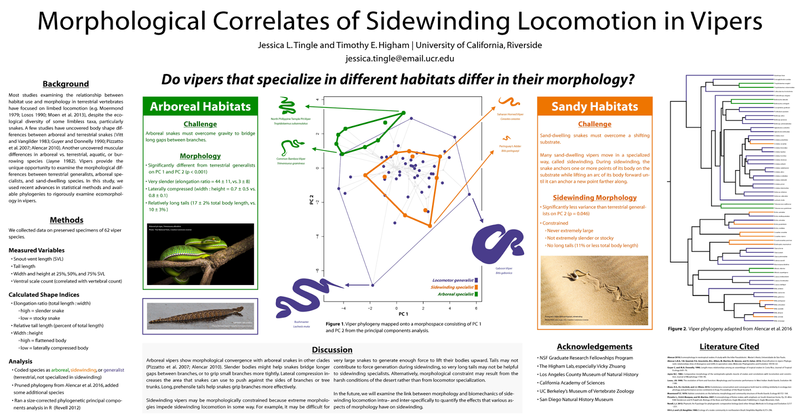 Today’s poster comes from Jessica Tingle, who I met at the recent Society for Integrative and Comparative Biology meeting in New Orleans, where she presented this poster. Click to enlarge – if you need to! You might still be able to read the title and see some of the main shapes on the poster. That’s why I think this poster was one of the clear winners at a conference where I was frustrated by how small many of the posters were (more about which later). The secrets to this poster’s success are not complicated. Jessica used most of the available space. SICB has big poster boards (8 feet long by 4 feet high, I think), and this one covered most of it. The title is in large point size, and has no colours or logos competing for attention. It has one big central graphic, with few colours that are clear and intuitive (green for snakes in trees, more earthy orange for snakes in deserts). The two colour-coded call out boxes explain the central plot of data well, using simple, icon-like outlines of the snakes. The change I might have suggested are small. The title could have been more specific. I might have suggested something like, “Treeclimbing, but not sidewinding, snakes are morphologically specialized.” This would also have removed the need for the big question right above the data. Similarly, underlining the headings adds nothing to their visibility. Bolding alone does the job. The boxing of the three call-outs works, because the colour of the lines connects the explanation to the data. The boxes there also make it clear that the text and images are serving as labels to the data, instead of part of the main text. The discussion is in a box, too, but it’s more subtle: very light gray with no outline. Indeed, the gray is so light that I am not sure anyone notices. And the discussion isn’t in the location you expect it to be (right), so feels like an awkward afterthought. I do appreciate that the discussion is split into two columns to prevent the line widths from getting unreasonably long, though the space between the columns might be widened to signal that there are two distinct columns. This poster’s use of one data plot and visibility from a distance pays off.